Step 1: Make the Chipotle Salsa. Step 3: Set up your charcoal grill or smoker according to the manufacturer’s directions. Step 4: Place a small mound of charcoal in the firebox (or to one side of a kettle grill) and light it. When the coals glow red, place the cold steaks in the smoke chamber (as far away as possible from the fire). Toss the hay on the coals and cover the smoker. Smoke the steaks until bronzed with smoke, but not long enough to cook them: this will take about 3 minutes. 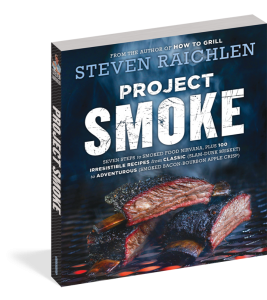 Remove the steaks from the grill or smoker. Step 5: Rake the coals into a mound to generate a high heat for direct grilling. Brush and oil the grill grate. Sear the steaks to the desired doneness, about 3 minutes per side for medium-rare—longer if you like your steaks more well done. Step 6: Transfer the steaks to a platter and let rest for 2 minutes, then serve with the Chipotle Salsa. Note: Small amounts of hay can be purchased at pet supply stores.